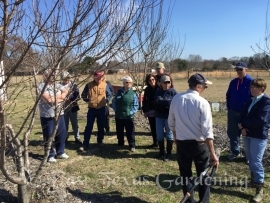 As a garden coach and consultant, I bring 30 years of experience as a former Extension horticulture educator helping folks with their landscapes, yards and gardens. I have worked with a diverse range of clients, from newcomers to the area needing help with identifying plants in their yard, to seasoned gardeners with perplexing problems or specific questions. Backed by the knowledge gained through two horticulture degrees, along with retail nursery and landscape experience and Extension work, I can provide the most current, unbiased, accurate, science-based information available. I provide real-world solutions with the goal of being as sustainable and earth-friendly as possible. A garden coach is ideal for the do-it-yourselfer who only lacks confidence in how to carry out a landscaping or gardening project. As a consultant, I can provide recommendations and diagnostic services for plant problems. My recommendations focus on working with, rather than fighting against, the conditions which you have in your yard. Note – I do not draw formal design plans, nor offer construction advice, but can recommend professionals who can. I can help with all aspects of your landscape or garden: design ideas, planting suggestions, identification of plants, and plant maintenance. While there is no such thing as a “no maintenance” landscape, there are ways to reduce maintenance chores while at the same time enhancing your surroundings. Maintaining your yard doesn't have to be intimidating, and choosing the right plants can reduce the time and effort required to have a beautiful yard. If you need some direction to get your gardening ideas going, or need to learn how to maintain your existing landscape, a session of garden coaching or consulting may be what you're looking for. On an hourly basis, I can meet with you to brainstorm design ideas, suggest plant choices, and answer your questions. I can also give you advice about maintenance (when to plant, pruning, dividing / propagating plants, fertilizing, watering, mulching, etc.). Need some help with staging your home to increase curb appeal for faster sale? I can provide easy solutions to quickly enhance the yard which is the first thing prospective buyers see when driving up to the house. These might include suggestions for accent plants to provide "pops" of color and visual interest, advice for removing / replacing overgrown shrubs, and simple ideas to reduce "busyness" and to draw the eye to the front entryway. Coaching/Consultation rate: $75/hr. (two-hour minimum for the first visit, hourly for any follow-ups). Availability - Consulting and coaching services are available in the general Tyler area. No charge for travel within a 15 mile radius of Tyler, Texas. Beyond that radius ($0.56/mile round trip) will be charged in addition to the hourly rate. Contact me to see how I can help you with your landscaping and/or gardening needs.